Amazon linen closet products that not only are easy on your eyes but also on your budget are what we have gathered together for you in this roundup. We have some beauties for you that might be unexpected. 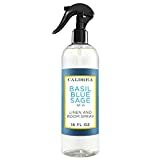 Amazon linen closet products are great finds! You don’t have to leave the house and can mark off something in your organization to do list. Some places go overlooked because they aren’t in plan view. We find that our linen closet falls under this category, but not after these solutions! We think after you see these products we came across on Amazon for your linen closet, you will be moving up the linen closet to the first place you want to organize this year. Crocks are great solutions to keep the farmhouse feel carried into your closet and they hold items such as your cleaner or linen sprays. Check out what they look like when we organized our linen closet on our How to Use Pinterest to Organize Your Home post. Wooden crates are another way to keep things compartmentalized. You could roll up your hand towels and washcloths and keep them in this bin for a touch of organization. Wasted space will be a thing of the past when you add this 13 pocket storage bag to your linen closet. This Amazon find is not only pretty to look at but great to hold all the little things that need a place that won’t allow them to fall through the wire shelves and get lost on the floor. This rectangular fabric bin would be great for towel or sheets. Not to mention it has handles, so it is easy to carry if you need to pull it out for laundry day. How many things can you come up with to go into this home storage basket? We can think of so many! Toilet paper, cleaning products, beach towels, laundry soap and so many more. And it’s another with handles to make for easy carrying. Glass jars are great in a linen closet to hold things you need to store in a different container after opening. Such as cotton balls, q-tips and powder detergents. While hunting on Pinterest for organization ideas. 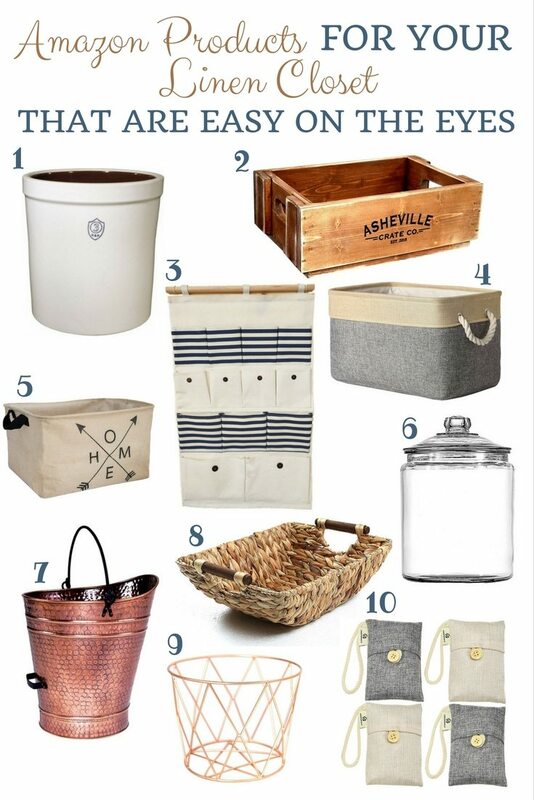 We came across cute ideas to incorporate coal buckets. Someone used it as a caddy for when guests come over. You can keep a towel and washcloth with some bathing products tucked away in this coal bucket in the linen closet and it will be ready for you to pull out for the company to use. 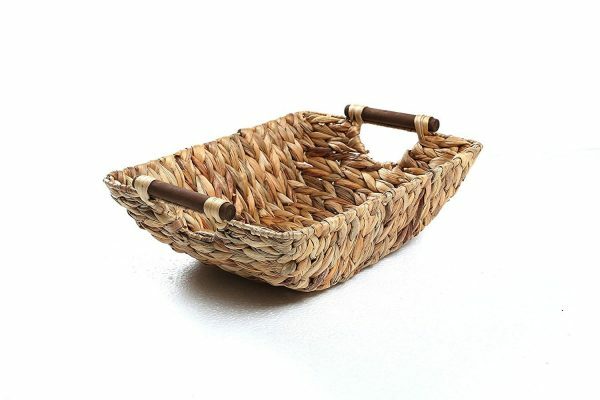 Hyacinth Baskets are one of our favs! They are timeless! They can hold many items from bars of soap to blankets and a pillow. This beauty will fit with many looks and slide easily into your linen closet. This copper wire storage basket is super trendy. With the benefit of helping organize, yet still being about to see it contents. Let’s be honest. One thing that gets overlooked and most of us don’t want to talk about is the lack of pretty smells that can come from our linen closet. This odor absorbing and air purifying product is a must when you want to pay attention to every last detail! 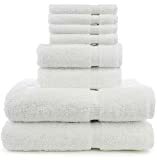 Amazon linen closet products have been fun to review today. We hope that you have been inspired and feel like they were not only easy on your eyes but will also be easy on your budget and easy to incorporate into organizing your linen closet.